In 2003, the landmark Prostate Cancer Prevention Trial (PCPT) identified finasteride as the first effective agent to prevent prostate cancer. However, Clement Ip, Ph.D., director, Cancer Chemoprevention at Roswell Park Cancer Institute in Buffalo, New York, found the results somewhat puzzling. “It was puzzling, because finasteride is known to powerfully depress the blood levels of the most potent androgen in the body, dihydrotestosterone (DHT), while reducing the incidence of prostate cancer by only about 25%,” Dr. Ip said. DHT acts by binding to the androgen receptor, a critical step that allows DHT to turn on certain genes involved in the function and survival of prostate cancer cells. This mechanism is called androgen signaling, which is “vitally important to the development and progression of prostate cancer” he explained. At about the time finasteride was in the headlines – which included debate over the drug’s side effects – Dr. Ip’s lab was discovering that the natural compound selenium is able to dramatically reduce the abundance of androgen receptors in prostate cancer cells. “We wondered if a one-two punch, using finasteride and selenium, might dampen androgen signaling more effectively and thus offer a better response in prostate cancer prevention,” he noted. NCI* is providing 5 years of support for Ip’s lab to explore the finasteride plus selenium combination to prevent the progression of prostate cancer. “If we are going to find a synergy by combining them,” explained Dr. Ip, “we really need to understand how each of the drugs works at the molecular level.” He and his colleagues will study the significance of certain genetic pathways to get a clearer picture of exactly how this promising treatment might suppress the growth of tumor cells in the prostate. The goal is to prevent the small-volume, low-grade tumors from becoming a more aggressive form of the disease. Once they have a better idea of the molecular pathways affected by the two agents, the next step for Dr. Ip’s lab will be an intervention trial in humans. Men diagnosed with prostate cancer sometimes elect to have the prostate removed. The researchers plan to conduct a short-term trial by giving treatment to such men for several weeks prior to surgery. When the prostate tissue from these patients becomes available, Dr. Ip and colleagues hope to get confirmatory evidence about whether the androgen signal strength is depressed, which genes are turned on or off, and how well the combination treatment stops cancer cells from multiplying. “Even though a quarter million men in the United States are diagnosed each year with prostate cancer, we know that many more than that number are in the earliest stages of developing the disease,” Dr. Ip commented. “Currently, we’re not sure what causes some of these to become clinical cancers that will require treatment.” He hopes combining finasteride and selenium could potentially provide a breakthrough in managing the disease at an early stage and help to alleviate the huge costs for medical care and in human suffering caused by prostate cancer. Prostate cancer kills more American men annually than any other type of cancer except for lung cancer. These high rates of mortality and morbidity do not occur in Japan and other Asian countries, although men in those cultures are found to have just as many small or latent prostate cancers when autopsied. Much more often, men in Western Europe and America see their prostate cancers progress and spread (metastasize), especially to the bone marrow. Many scientists believe that behavioral and dietary risk factors may hold the key to understanding these variations in the disease. 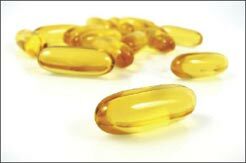 Noting the much higher intake of fish and seafood in Asian diets, Yong Q. Chen, Ph.D. director of Basic Science at Wake Forest University’s Prostate Center of Excellence, believes that polyunsaturated fatty acids (PUFAs) found in fish oils could play an important role in cancer progression. This relationship is being investigated further. The effect seen with omega-3 appears to work, in part, through a gene called Bad, which produces a protein that goes by the same name. Dr. Chen noted, “When we knocked down (inactivated) the Bad gene in the mice, the cancer cell death stopped, and then the cell death resumed when we added the Bad protein.” This finding highlights the importance of gene-diet interactions in prostate cancer. “Our work reinforces the idea that the amount and content of dietary fat can have a drastic impact on the health of animals with identical genetic profiles,” he added. Dr. Chen said their research also suggests the idea that omega-6 and omega-3 PUFAs “fight” each others’ effects in the body, often producing opposite effects at the molecular level in the cells. “Thus, it is crucial that the Western diet move toward the one-to-one ratio for intake of both types of fats,” he noted. “We realize that dietary change for an entire population is a major challenge, but for prostate cancer patients, this takeaway message is much more critical–omega-3 fatty acids in the diet may inhibit metastasis.” As a next step, Dr. Chen is planning a phase I trial of PUFA diets in patients with locally advanced prostate cancer.